PennsylvAsia: Japanese Coming-of-Age Ceremony (成人の日) at Pitt for students turning 20, January 11. Japanese Coming-of-Age Ceremony (成人の日) at Pitt for students turning 20, January 11. Kasai does 成人の日 in 2010. About 25 students from Yasuda Women’s University in Hiroshima, who were at the University of Pittsburgh for five months learning English, were away from home in January, missing out on the annual Coming of Age ceremony, a national holiday in Japan. So, Pitt’s Asian Studies Center threw a party — kimonos included. A banner that reads “University of Pittsburgh Coming of Age Day Ceremony” in Japanese greeted student Nika Tanimoto and other participants. “This Coming of Age ceremony seems like the perfect confluence of the University, our Japanese students and the community to celebrate together,” said Lynn Kawaratani, the center’s acting associate director. Members of the Pittsburgh community, the Japanese Nationality Room Committee and the Japan America Society of Pennsylvania all loaned kimonos for the students to wear. The Asian Studies Center has been partnering with Pitt’s English Language Institute for about a year, developing programming for these international students as well as Pitt students. Seijin Shiki or 成人式 could be translated as 'Coming of Age Day Ceremony' in English. 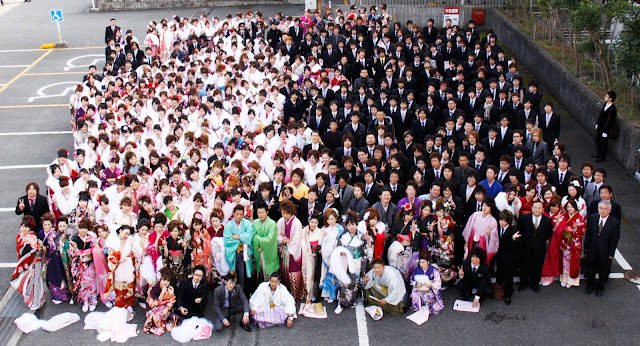 Seijin-no-hi (Coming of Age Day) is a Japanese public holiday that occurs on every second Monday of January. Coming of Age Day or Adult's Day honors every person that has turned 20 years old over the past year. When young people reach twenty they officially become adults in Japanese society and they now have responsibilities as well as newfound liberties: such as being able to drink, smoke, go to hostess bars, gamble and to drive legally. The voting age was lowered from 20 to 18 in 2015. The girls always wear gorgeous and very expensive kimono, although most admit to having rentals as the outfit is worth up to 1,000,000 yen. The boys usually wear a regular suit and tie but a few will wear traditional Japanese dress. It runs from 7:00 to 8:30 pm in Ballroom B of the University Club (map), and those interested should email asia [at] pitt.edu.